1965 Topps and how great the Cardinals and Yankee cards looked. My first baseball memory was Reggie's 3HR game in the 77 world series as a 5 year old. 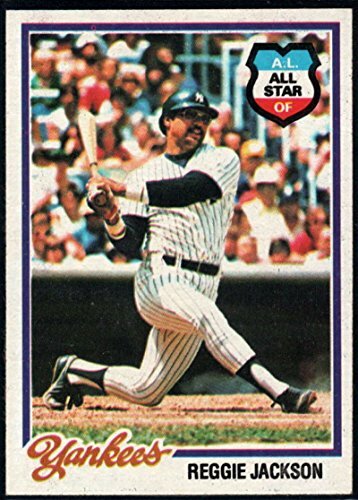 The next year, I got my first baseball cards and the 78 Reggie was a mythical, larger than life card that I still love to look at - even though the '80 Reggie looked very similarly. I only had a few from '79 before getting elbows deep in '80. That was the first set that I got complete. I used to play with those cards so much, the corners were rounded and they looked a bit oval. Close to a perfect card, with the AS logo and bended knee. Last edited by Bigdaddy; 04-14-2019 at 06:24 PM. 1970 baseball.I probably purchased 20 packs over the summer. My first packs though were 1969 football. I continued with football packs over the next few years and have many of those childhood purchases in my completed football sets from 69 to 72. Last edited by Leon; 04-15-2019 at 08:30 AM. 1962 Topps sixth series. I was seven and my parents let me ride my bike to the Glaser drugstore a few blocks from my house. I only bought one pack - hadn't quite grasped the concept that there were other cards available. The next year I would go to the A&P grocery with my Mom. While she shopped, I sat on the floor rummaging through every last box of Jello looking for Cardinals and wondering where Stan Musial was hiding.